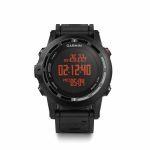 The Garmin Fenix 2 smartwatch is designed with �multisport� athletes and sports enthusiasts in mind. It features a 1.2-inch monochrome LCD display. This allows it to operate with lower power ratings than comparable devices, and it�s also transflective � easily readable in sunlight. A high-sensitivity receiver and GPS radio allow this thing to track location and environment even under extreme conditions. When paired with a heart-rate sensor, it will even estimate recovery time until you�re safe to jump into another activity. The rechargeable 500 mAh lithium-ion battery allows for 50 hours of use in �UltraTrac� mode, 20 hours when GPS is active, and up to 5 weeks in watch mode. It can receive notifications and alerts from a smartphone to keep you connected. 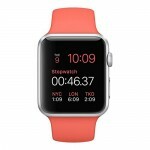 It�s also water resistant up to 5 ATM (50 meters or 164 feet).